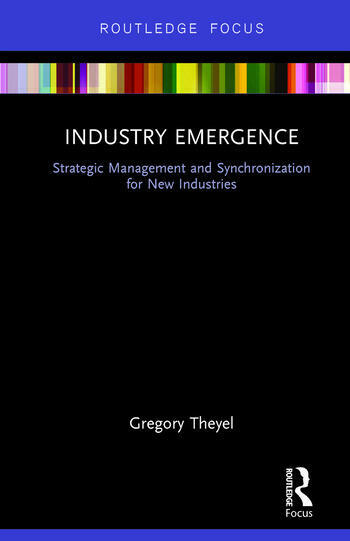 This book develops a novel industry emergence framework to explain the features, interaction, and synchronization of key elements for the birth and growth of new industries. Organized around seven elements—firm strategy, technology, investment, supply networks, production, markets, and government—Theyel’s framework provides inventors, managers, investors, scholars, and policymakers with a comprehensive understanding of how industries emerge, helping them to be more successful at influencing the birth and growth of new industries. Understanding industry emergence is important because new industries can offer the advancement of technology, improvements in human health and the environment, growth of firms, creation of jobs, and economic development. With learning objectives, theory, tools, case studies, and end-of-chapter questions, Industry Emergence will be a useful resource for students and professionals in engineering, science, business, and policy. Gregory Theyel is a Professor at California State University in the San Francisco Bay Area, USA. As president of Green Visions, a California-based research and consulting firm, he assists companies and governments with the commercialization of technology and the birth and growth of new industries. This concise, yet comprehensive handbook offers investors, entrepreneurs, policy-makers, and students, alike, a practical framework for disentangling the complexity of emerging industries, thereby reducing the immense uncertainty that shapes new industrial sectors. Intriguing examples illustrate the multifaceted challenges and motivate for deep-dive discussions. Industry Emergence is a valuable addition to the scarce literature in this field and will be appreciated by anyone who strives to understand the interdependencies within and deal with the dynamic nature of emerging industries.